Tired of high overhead on your studio or client meeting space? Do you wince when you think of how few hours you are at your space per month versus what you pay? If you’ve found yourself thinking those things before, don’t worry, I totally get it. Maintaining your own studio space can be expensive, time-consuming, and honestly, sometimes the benefits don’t even outweigh the costs. So….how do you utilize the benefits of a studio space without the headache of maintaining one? Let me introduce you to Blank Space - Anchorage’s downtown shared studio location. A studio share allows you to rent out space at a modern studio for a given block of time - whether that’s a few hours or a few days - based on your individual business needs. Still not sure? Here are 5 reasons why renting a shared studio space can be super beneficial. Our studio share provides modern and accessible space for meeting clients right in downtown Anchorage. 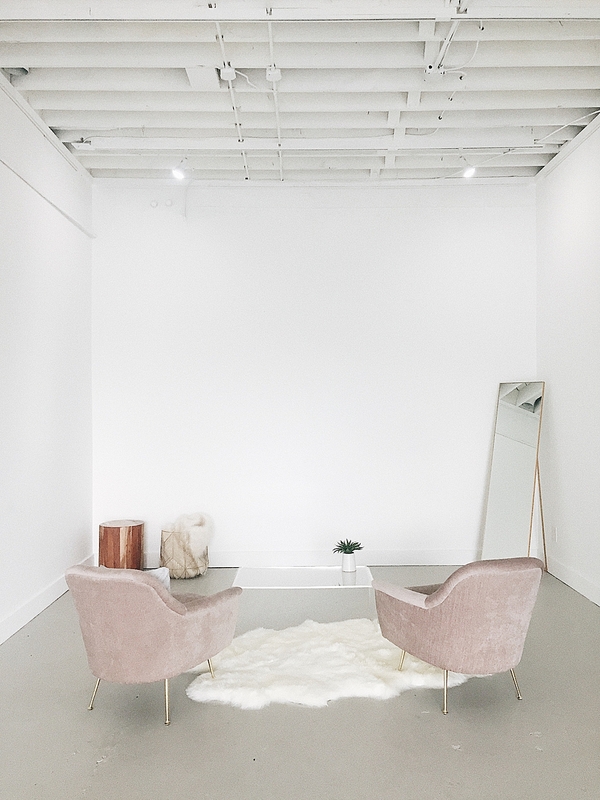 Whether you’re a photographer needing a shooting space, an artist needing a workspace, or you just need a spot to have meetings with clients, you need a space that’s stylish, accessible, clean, and up-to-date - and overall a space you’re proud to show off to clients. Like we talked about, maintaining a full-time studio space can be really expensive. And, let’s be honest - meeting clients at a local coffee shop can be a hassle, and doesn’t have the same air of professionalism as they can be loud and disruptive. Another option is to have your studio in your home, but for a lot of people that just isn’t feasible, as many homes don’t even have the space for it. Working at home also isn’t always the most conducive for fueling creativity either, and there’s lots of distractions there that can get in the way of doing the work you need to do. For a low fee, you can schedule meetings in this beautifully appointed shared space, and eliminate the need for paying for the entire studio yourself while still having access to a space that allows your creativity to shine. 3. You Don’t Have To Clean The Place! If you have your own studio space - whether it’s in your home or it’s a commercial property - you’re on the hook for keeping it clean. And, sure, while you still have to clean up your things once you’re done using a shared space, the majority of the housekeeping is taken care of by us. No need to clean the space yourself, research good and reliable housekeeping staff, or deal with the possibility of clients walking into a messy studio space! Our shared studio is clean, professional and sports a contemporary lounge. Meet with your clients in our convenient downtown location with parking available right on 4th Avenue. Wi-Fi is available, and you’re always assured a prime place to sit! Blank Space space features high ceilings and white walls with an abundance of natural light. This makes it the perfect space for photography. We are also stocked with props to use if you wish! No need to renovate a spot in your house or your own studio, because we’ve already created the perfect artist’s space! Create beautiful portraits in the space, meet with potential clients or hold proofing and ordering sessions. Another option to forgoing the studio is working outside. However, for a lot of artists, this just isn’t feasible. And for photographers, you’re at the mercy of the temperamental Alaskan weather. The studio is a lifesaver when the weather doesn’t allow you to shoot outside when the session must be done! Professionalism doesn’t have to come at a cost that hurts your bottom line. Our studio is available by the hour or day without any long-term contracts or leases. Rent as much or as little as you like! Small workshops and meetings for up to ____ people are also welcomed. Interested in knowing more about this studio space? Contact us at blankspaceak@gmail.com to view the space and find out more about the amenities offered. Be sure to join our newsletter and save 10% off your first booking! Sign up and receive 10% off your first rental. Plus, get exclusive access to same-day deals, helpful tips, and more.